You need a shared folder for all ES nodes. One typical setup is NFS. 1. In one ES node, setup a NFS server with a big volume. 2. 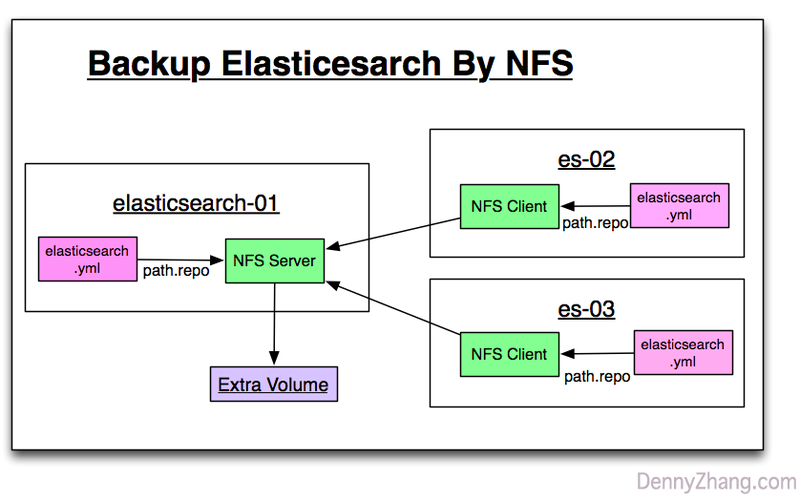 From all other ES nodes, mount it as NFS client. Umount NFS immediately, if you don’t need it. NFS service is troublesome. It might introduce unreasonable high CPU load to all nodes. Let me repeat it again: unreasonable high! Always check return code, before running the following procedure. Without this principle, any automation would be dangerous. Full backup VS Incremental backup. rsync VS scp. Previously I need to migrate a big system from one data center to another. One major challenge is how to migrate 3TB ES cluster(10TB data) with minimum downtime? 1. Perform first round of backup and restore. No downtime for this. 2. Run second round of backup. As an incremental backup, it's fast. 3. Use rsync to copy over TB data across WAN. Not scp. 4. Rsync from N nodes to M nodes, is faster than 1 to 1. 5. Run second round of restore in cluster2. It's relatively fast. Record time performance, for future reference. How large original data and backupset, how long each critical step(backup/copy/restore) takes. Prepare a volume. It should be big enough to hold your snapshots. Nowadays all modern cloud providers provide block storage service. Much better than before. # Customize the values for your env. Verify elasticsearch.yml is configured correctly in all nodes. If not, update elasticsearch.yml. And restart the ES instance. # Customize this: the volume folder might be different for different cloud provider. fstab_command="$volume_folder $es_fs_mnt ext4 defaults,nofail,discard 0 0"
mount -t nfs "$nfs_server:$es_fs_mnt" "$es_fs_mnt"
We can backup and restore snapshot for selective indices. # Here we use time to get status. watch "du -h -d 1 $es_fs_mnt"
Backup could take hours. Check the snapshot status. curl $es_ip:$es_port/_cat/shards?v | grep " p "